Are you thinking your tortie gives new meaning to the word "catitude?" Is your calico a bit feisty when things aren't going exactly her way? A study by UC Davis veterinarian Elizabeth Stelow proves what a lot of us have suspected all along. Torties and calicoes tend to be diva cats and can be more than a little challenging to their human companions. Stelow and her research team surveyed 1200 cat parents online. They found that calico and tortoiseshell cats are more likely to "hiss, chase, bite, swat or scratch during interactions with humans.” Gray and white and black and white cats seem to have an abundance of catitude, too, and are likely to be a bit more aggressive than cats with other coat patterns. The sweetest cats? An earlier study suggests those would be the orange males. That study, done by researchers at California State University and the New College of Florida, set out to discover humans' biases based on cat colors. The online survey of nearly 200 people asked participants to associate 10 personality traits (active, aloof, bold, calm, friendly, intolerant, shy, stubborn, tolerant and trainable) with five cat colors (orange, tricolored, white, black and bicolored). 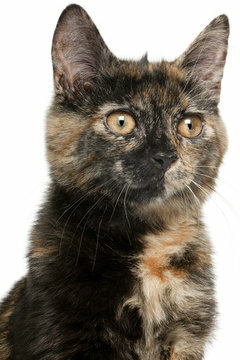 Most of the people surveyed thought torties and calicoes were aloof and intolerant. White cats, too, were seen as aloof and shy but calm. Like orange cats, bicolored cats ranked high for being friendly. And black cats? Unfortunately, no trends emerged, although most people who know them would say they're affectionate and friendly. 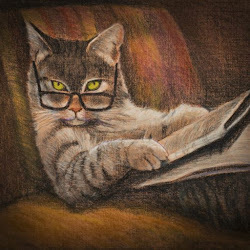 Of course, the caveat to all this research is that every cat is different. One of the torties I live with can be a hissing, growling spitfire. The other is a gentle soul who licks my hand at night until I fall asleep. Stelow agrees you can't judge a cat by its color. “We thought the findings were very interesting, and we would love other researchers to take the baton and run with it, to look at the genetics of why this may be happening,” she told the Seattle Times. "We're not suggesting that anyone avoid having these cats in their homes. Most of them make lovely pets. It’s just information to help you understand what you might be up against." Maybe. But nothing could have prepared me for what I was up against when I met my cute little spitfire, Ginger!